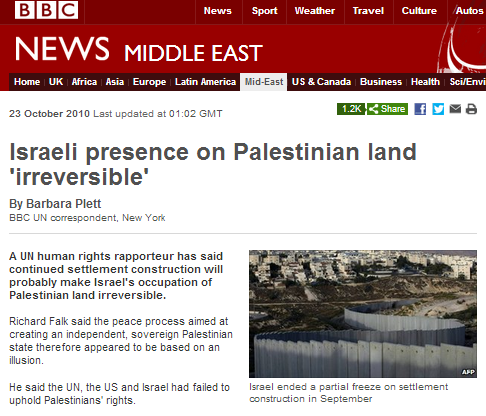 As documented here at the time, the BBC’s coverage of UNSC Resolution 2334 included an item by Barbara Plett Usher broadcast on BBC Radio 4 on December 24th 2016. BBC Watch submitted a complaint in which we noted that by describing the resolution as “legally binding”, Plett Usher inaccurately suggested to listeners that it was adopted under Chapter 7 of the UN Charter rather than Chapter 6. “You were unhappy Barbara Plett Usher referred to UNSC resolution 2334 as “legally binding”. While a resolution passed under Chapter 6 of the UN Charter could be used in an evidentiary capacity in an international court, it can be challenged and is not “legally binding”. Whether or not the average Radio 4 listener is aware of the difference between Chapter 6 and Chapter 7 resolutions and hence would not – as Plett Usher claims – have been misled by her description of Resolution 2334 as “legally binding” is of course debatable. 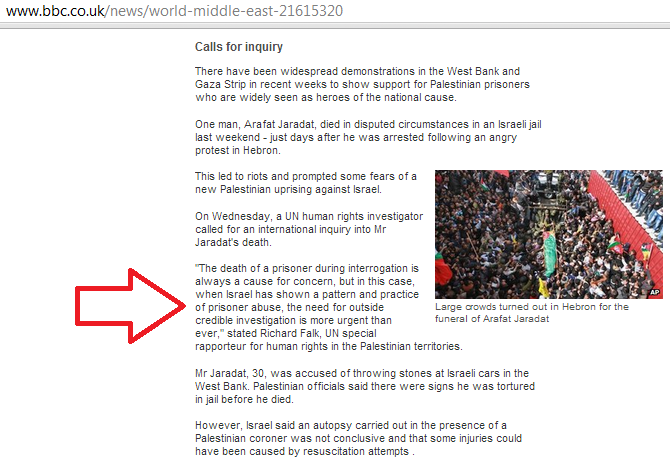 Events at the UN Security Council received generous coverage on the BBC News website on December 23rd and 24th. BBC audiences found articles relating to Egypt’s withdrawal of its draft resolution and reports concerning the subsequent tabling of the resolution by New Zealand, Senegal, Venezuela and Malaysia which was approved by the UNSC on December 23rd. The narrative promoted in those reports was uniform and conformed to existing BBC editorial policy. a) BBC audiences were repeatedly told that the resolution related to Israeli communities on “occupied” – rather than disputed – land and that the said territory is “Palestinian”. b) BBC audiences were also repeatedly told that Israeli communities in Judea & Samaria and parts of Jerusalem are “illegal” and breach “international law” while the presentation of alternative views on that issue was limited to a box-ticking reference to the Israeli view with no further detail or explanation. c) The reports failed to distinguish between “settlement building” and construction in existing communities, thereby giving audiences the mistaken impression that new communities are being built. d) One of the reports promoted the inaccurate implication that construction under the current Israeli government is exceptional. e) The reports uncritically amplified the PLO narrative of ‘settlements as an obstacle to peace’. f) References to the parts of the resolution condemning terror and incitement were to be found in just one of the BBC’s reports. In contrast to the impression given to BBC audiences, the word ‘Palestinian’ is in fact not included in that part of the text. g) While some of the later reports included reactions from “the Palestinian leadership”, none of them informed audiences of the fact that the resolution was hailed by the terror organisations Hamas and the Palestinian Islamic Jihad. h) Three of the later articles (reports 4, 5 and 6) quoted the US ambassador to the UN as saying that “even if all settlements were dismantled, both sides would still have to acknowledge “uncomfortable truths” and make “difficult choices” to reach peace” but none of the reports reminded BBC audiences that although Israel did indeed remove all ‘settlements’ and ‘settlers’ from the Gaza Strip in 2005, peace was not forthcoming and the Hamas terror group continues to seek the destruction of Israel. i) None of the reports reminded BBC audiences of the 2009 freeze of construction in communities in Judea & Samaria and the fact that the Palestinians refused to negotiate during most of that ten-month freeze. j) None of the reports provided readers with the relevant context of the Palestinian Authority’s attempts to impose an outside ‘solution’ to the conflict in preference to negotiations. k) None of the reports provides any relevant historical background on the subject of the 1948 Jordanian occupation of Judea & Samaria and parts of Jerusalem or the 1967 Jordanian attack which subsequently left Israel in control of those areas. Anyone wondering why the generous coverage of this story was uniformly one-sided and failed to provide BBC audiences with the full range of information necessary for proper understanding might find the following Tweet from the BBC’s Middle East editor (also retweeted by the BBC correspondent who contributed to much of the coverage) enlightening. On the afternoon of December 22nd (before news broke of Egypt’s withdrawal of its draft resolution tabled at the UN Security Council) listeners to the BBC World Service radio programme ‘Newshour’ heard a report (from 50:04 here) relating to that story. Obviously there are no Israeli ‘settlements’ in those areas and so the use of such inaccurate terminology misleads listeners. Israeli communities do exist in Area C and in parts of Jerusalem previously occupied by Jordan for nineteen years. Under the terms of the Oslo Accords no limits are placed on construction in those regions and their final status is to be determined in negotiations. Listeners to this item, however, were not provided with that all-important context and the language used by Plett Usher and Coomarasamy clearly endorses and promotes the Palestinian side’s political claims and narrative, thereby compromising BBC impartiality. Listeners also heard several references to “settlement building”. Just last September the BBC News website amended similarly misleading language – which leads BBC audiences to mistakenly believe that Israel is constructing new communities rather than – as is actually the case – houses being built in existing towns and villages – most of which would under any reasonable scenario remain under Israeli control in the event of an agreement. Plett Usher’s claim that “this particular Israeli government has…has done a lot of settlement building” does not stand up to scrutiny and does not clarify to audiences the existence of what Ha’aretz earlier this year termed “an informal construction freeze”. It is by no means surprising to see the BBC continuing to push its well-worn but unabashedly partisan mantra on the topic of ‘settlements’ – the corporation has, after all, embraced that editorial line for years. However, as this report once again demonstrates, that editorial policy hinders audience understanding of both this specific story and the issue in general. The Tweet below was sent by the BBC’s US State Department correspondent Barbara Plett on January 14th 2016. Why Ms Plett found it necessary at this time to use her BBC branded Twitter account to resurrect an article unrelated to her field of reporting nearly three years after its initial publication remains a mystery. What is clear however is that the article promoted by Plett is about a study that is by no means “new” and which was shown at the time to be highly controversial. The promotion of a discredited study with distinct political overtones by a BBC journalist would clearly undermine the corporation’s reputation for impartiality at any time. When such promotion is done by a journalist who has already been shown to lack an impartial approach to the subject matter concerned, it is obviously all the more problematic. 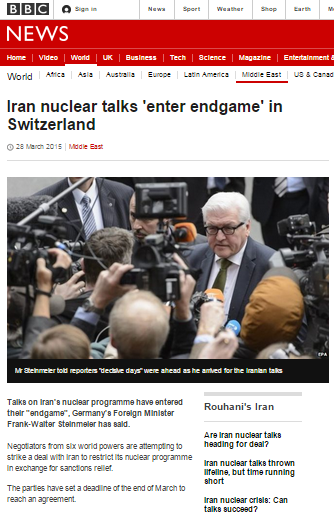 On March 28th an article appeared on the BBC News website’s Middle East page under the headline “Iran nuclear talks ‘enter endgame’ in Switzerland“. Relating to the apparently imminent prospect of a framework deal between the P5+1 and Iran concerning the latter’s nuclear programme, the report is remarkably economical with regard to the content and efficacy of the deal itself, framing the issue in very generalized terms. He has already met US Secretary of State John Kerry in Lausanne. Iran insists its nuclear programme is for peaceful purposes but world powers fear it has military ambitions. Some of the most contentious issues remain unresolved, says the BBC’s Barbara Plett Usher. 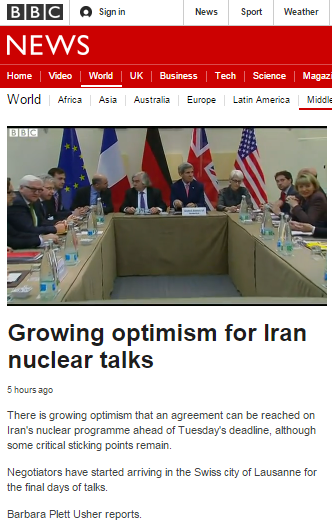 But will the deal – as Plett Usher claims – really “prevent any Iranian attempt to develop a nuclear weapon”? Aspects of the emerging results of negotiations make that statement highly questionable, as noted by other journalists presenting a far more critical and detailed picture of the negotiations than the superficial account offered to BBC audiences. “…it now seems Iran will be allowed to keep 6,000 of its centrifuges, considerably more than the 500-1,500 the US originally wanted, or the 4,000 “compromise” offer Washington made a year ago. The direction of travel is clear. Even more worryingly, the US is reportedly considering allowing Iran to keep some centrifuges at Fordow, the impenetrably hardened underground facility that Iran built in secret, and only admitted to having in 2009 after they were rumbled by Western intelligence. Western officials soothingly say there is no need to get hung up on the details, just focus on the one-year “breakout time” that keeps Tehran at least 12 months away from being able to make a bomb and trust to the inspections regime that will alert the world long before that happens. “Distrust and verify” says Mr Obama and yet scratch the surface of these negotiations and it is clear that there are plenty of reasons to question whether Iran will ever actually submit to the effective scrutiny on which the credibility of this deal ultimately rests. Twice, in 2007 and in 2013, Iran agreed with the IAEA on a “work plan” to clear up the military research issues. In both instances, it then stonewalled inspectors, refusing to answer questions or permit access to sites. After the agency sought access in 2011 to a military complex called Parchin, where warhead detonation tests may have been carried out, satellite surveillance revealed that Iran had demolished buildings and excavated ground in an apparent cover-up operation. In frustration, the IAEA published an extensive report detailing what it already knew about the illicit bomb work and listed 12 outstanding issues. Two years later, in the hope of sealing an interim deal allowing the partial lifting of sanctions, the government of Hassan Rouhani agreed on a “step-by-step” plan to answer the questions. But instead of implementing the plan, the regime went back to stonewalling. IAEA chief Yukiya Amano told The Post’s Steven Mufson this week that Iran had provided information on just one of the 12 issues. On two others, Mr. Amano said, it had given “very limited” responses, and the remaining nine had not been addressed at all. An appropriate response to this blatant violation of agreements would be to insist that Iran complete the IAEA work plan before any long-term accord is signed or any further sanctions lifted. Inspectors need their questions answered so that they will be able to determine later whether Iran has violated the controls on its nuclear research expected to be part of a deal. Furthermore, it is vital to establish that Tehran will deliver on its commitments and that it will be held accountable if it does not. Members of the BBC’s licence fee paying public will no doubt be asking themselves why the two above publications – among others – are capable of providing serious analysis which really does “enhance audiences’ awareness and understanding of international issues” whilst the corporation which bills itself as the “standard-setter for international journalism” makes do with superficial, anodyne reporting on such a crucial topic. The UN’s ‘Special Rapporteur on Palestinian Human Rights’ Richard Falk is in the news again, this time due to the call on him to resign from the post which recently came from America’s Ambassador to the United Nations Human Rights Council, Eileen Chamberlain Donahoe. Of course one would have to have one’s head pretty firmly buried in the sand not to be aware of the fact that Falk’s history of inaccurate and offensive statements goes back a very long way indeed. From his 1979 New York Times puff-piece in defence of Ayatollah Khomeini, through to his claims that the 9/11 terror attacks were orchestrated by the US government, his repeated justifications of Palestinian terror and his public support for the ‘one-state solution’ (i.e. the eradication of Israel as the Jewish state), Falk has never been far from controversy. 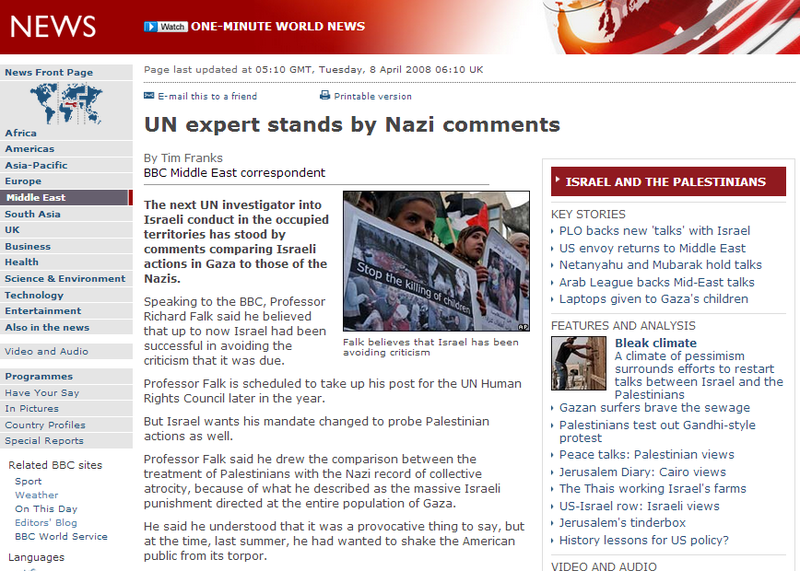 That fact was well known by the BBC when Falk took up his UN position in 2008, as an article by Tim Franks from April of that year shows. In May 2008 the BBC’s Stephen Sackur interviewed Falk on ‘Hardtalk’, where he defended his use of anti-Semitic Nazi analogies. And yet, the BBC – despite being bound to standards of accuracy and impartiality – has continued throughout the years to quote Falk on the subject of Israel extensively, unquestioningly and without properly informing its audiences of his long-standing history of bias and open animosity towards Israel. Here, for example, is a 2010 article by Barbara Plett which promotes statements made by Falk on the subject of “settlements”. 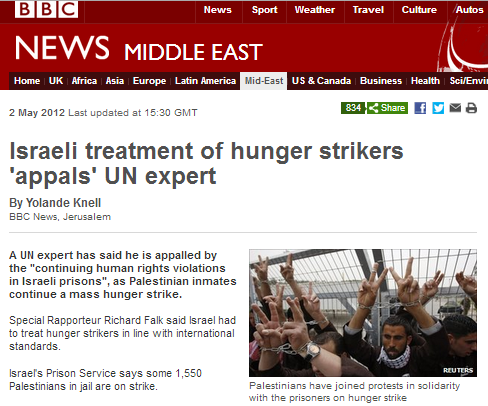 Here is a 2012 report by the BBC Jerusalem Bureau’s Yolande Knell on the subject of Palestinian hunger strikers which – whilst neglecting to mention their membership of the Palestinian Islamic Jihad – also extensively promotes statements made by Falk. And here is Knell yet again – this time in February 2013 – quoting Falk’s regurgitation of Palestinian Authority propaganda regarding Arafat Jaradat. 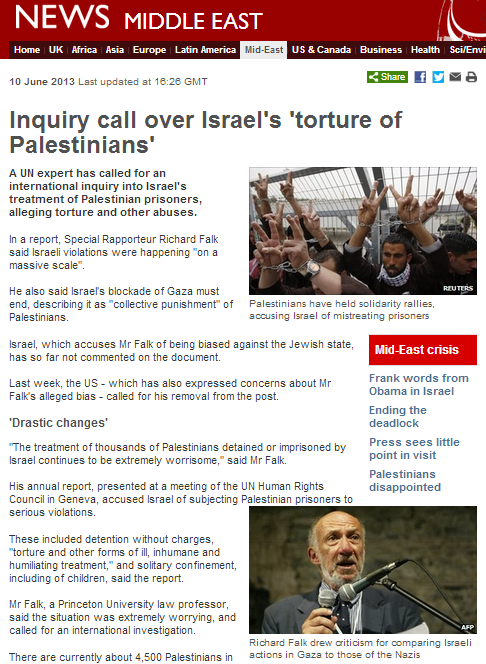 Most recently, on June 10th 2013, the BBC published yet another article based on statements by Falk. Towards the end of that piece it is noted that “[i]n 2008, Mr Falk drew widespread criticism for comparing Israeli actions in Gaza to those of the Nazis”, but the article fails to make clear to readers the antisemitic nature of Falk’s comments and also makes no effort to explain to readers why “the US – which has also expressed concerns about Mr Falk’s alleged bias – called for his removal from the post”. Why the BBC seems to feel the need to play down Falk’s long history of anti-Israel campaigning, antisemitic remarks, adherence to conspiracy theories and general offensiveness is one question. How the BBC thinks it can meet its required standards of accuracy and impartiality by unquestioningly repeating and promoting the opinions of a man it knows full well to be far removed from both of those criteria is a yet more pressing question which needs to be asked more than ever at this time. “At any given time there is a BBC line on everything of importance, a line usually adopted in the light of which way its senior echelons believe the political wind is ­blowing. This line is rarely spelled out explicitly, but percolates subtly throughout the organisation. Such an attitude perhaps goes some way toward explaining the BBC UN correspondent’s resounding silence on the fact that during the past year the UN General Assembly has passed twenty two resolutions singling out Israel for criticism – and only four on the rest of the world combined. Notably ignored by the BBC is the fact that on December 18th – when no fewer than nine anti-Israel resolutions were passed in one day – one of those resolutions called for the Golan Heights to be returned “forthwith” to Syrian control. As the situation in Syria continues to deteriorate, the 20,000 or so Druze residents of the Golan Heights privately express great concern for the fate of their family members in Syria, with applications for Israeli citizenship (to which they have been entitled since Israel annexed the Golan in 1981) reaching an all-time high in recent months. The 2,000 or so Alawite residents of Ghajar, which also came under Israeli control in 1967, already have Israeli citizenship and they are certainly no strangers to arbitrary UN declarations made thousands of miles away with absolutely no relevance to the situation on the ground. As members of the minority sect to which the Assad family also belongs, one can only guess their fate were their village to be returned to Syrian control “forthwith”. A BBC which avoids engaging in critical thinking regarding the anti-Israel obsession of the UN and hence promotes a trite, one-dimensional view of the Middle East cannot but fail in its task to increase its audiences’ understanding of the region and the complexities of the issues its residents face. On December 21st 2012 a session at the United Nations General Assembly dealt with recommended draft resolutions on the subject of sustainable development. “Make no mistake. The stakes before us are high. The people we empower today will become the next Einstein, the next Picasso, the next Mother Theresa of tomorrow”. “Turning to the draft resolution titled “Entrepreneurship for development”, the Assembly adopted it by a recorded vote of 141 in favour to 31 against, with 11 abstentions. Obviously, members of the developing world would welcome such an initiative…wouldn’t they? Well, not some it seems – if it is proposed by Israel. Against: Algeria, Bahrain, Bolivia, Comoros, Cuba, Democratic People’s Republic of Korea, Djibouti, Egypt, Indonesia, Iran, Iraq, Jordan, Kuwait, Lebanon, Libya, Malaysia, Maldives, Mauritania, Morocco, Nicaragua, Oman, Pakistan, Qatar, Saudi Arabia, Sudan, Syria, Tunisia, Turkey, United Arab Emirates, Venezuela, Yemen. Strangely, I can’t seem to find a report on any of this from the BBC’s UN correspondent. December 20th 2012 saw yet another article in the Middle East section of the BBC News website about ‘settlement building’ – this time relating to the call by several European members of the UN SC to “immediately halt new construction” – which they seem to have failed to notice is not yet underway and is in fact a very long way from commencement. What the BBC neglects to inform its readers, of course, is that eastern Jerusalem was artificially divided from the rest of the city – for the first time in its history – for only 19 years prior to 1967, as a result of the Jordanian capture and subsequent annexation of certain parts of the city. That annexation was also never recognized “internationally”. Interestingly, the BBC report not only neglects to mention that there are already people living in that area, but also that half the proposed housing units in Givat HaMatos are ear-marked for Arab residents. In addition, it does not inform its audience that one day prior to the decision on Givat HaMatos, over 600 houses were also approved – by the same planning committee – in the Arab neighbourhood of Beit Safafa. Strangely, the latter decision did not appear to irk either the UN SC, the EU or the BBC. “If implemented, these plans would jeopardise the possibility of a contiguous, sovereign, independent and viable Palestinian State and of Jerusalem as the future capital of both Israel and Palestine”. “The outcry at the UN reflects a real concern that Israel’s continued settlement building could deal a fatal blow to the chances for a two-state solution of its conflict with the Palestinians. Of course both the EU statement and Plett’s matching one – whilst high on hubris – have little connection to the reality on the ground as far as geography is concerned and as reflected in different peace proposals over the years. The 2000 Camp David proposal – rejected by Arafat – included all of the sites of today’s proposed building in Israeli territory. Similarly, the 2008 Olmert proposal – widely accepted by many Israelis as representing the most they can offer to the Palestinians – also includes Ramat Shlomo, Givat HaMatos and E1 in Israeli territory. It is therefore notable that the BBC – along with members of the Quartet such as the EU – now appears to ignore all previous realistic proposals and instead embraces the rejectionist Palestinian approach to the dispute. It is also regrettable – and ridiculous – that they invent alarmist canards such as the notion that building houses in areas which – under any realistic peace plan – will remain in Israel “jeopardises” and “deals a fatal blow” to the chance of a two-state solution. “When it comes to E1, he said, the Israelis and Palestinians are competing to see who gets the balloon and who gets the string. Jewish West Jerusalem, Maaleh Adumim, Rammallah and Bethlehem are all there to stay. Whoever ends up controlling E1 will have a comfortable land corridor between their two balloons while the other side will be left with a road through the other’s territory: a string. If Israel controls E1, the Palestinians will have a north-south road through it; if the Palestinians own E1, the Israelis will have an east-west road through it. In addition to the five very pertinent points made by Mr Lozowick in the rest of his article, it is possible to add one other. If we assume that a peace agreement broadly based on something very similar to the two maps above will be the eventual outcome to the current dispute, then obviously significant numbers of Israelis will need to leave their current homes and livelihoods in Judea, Samaria and the Jordan Rift Valley and relocate to other parts of Israel. The current zoning and long-term planning in areas which will remain within Israeli territory under such a two-state solution agreement could therefore actually speed up its implementation rather than presenting a barrier to it. On the subject of Israeli zoning and planning decisions, the BBC is failing miserably to meet its obligation to impartiality by consistently neglecting to provide audiences with any information on the indisputably significant “strand of thought” which lies behind several past peace proposals and according to which, the existing neighbourhoods of Jerusalem with a Jewish majority beyond the ‘green line’ would remain Israeli. “The BBC Agreement forbids our output from expressing the opinion of the BBC on current affairs or matters of public policy”.